Group therapy is one form of treatment among many treatment services generally offered at a drug rehab center. The goal of this article is to open a window into what happens, step by step, during a typical group therapy session in a drug rehab program. But first, it is necessary to provide some context, which will be especially helpful to anyone who has no experience receiving treatment from a rehab center. Speaking broadly, drug rehab services have two main components: medical detoxification and therapy. Medical detox addresses the biological factors involved in addiction. Therapy addresses the psychological dimension of addiction. The two main types of therapy are individual therapy and group therapy. Rehab centers offer both individual and group therapy sessions to clients. There are additional types of therapy, such as family therapy (a form of group therapy), expressive therapy (e.g., art and music therapy), and animal therapy. There is not one path to addiction, nor is there one path to healing it. There are numerous research-based services, however, and an effective combination can provide the tools and training needed to maintain abstinence. 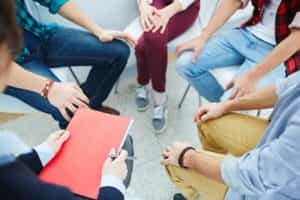 It is helpful, at the outset, to note that group therapy is not the same as group recovery meetings, such as Narcotics Anonymous. Group therapy, as will be discussed, is therapist-led. Group recovery meetings, or self-help groups, are member-directed. Within a recovery program, group recovery meetings are considered a supportive service rather than therapy. Group recovery meetings are integral to recovery programs across the US. In fact, most all programs either host group recovery meetings on site or factor off-site meetings into their curriculum. A group therapy session is composed of a therapist-facilitator and individual members. The therapist is certified and may have a specialization in a certain therapy approach. The therapy technique may have been developed specifically for groups, but it is likely going to be adapted from the individual therapy model. There are numerous therapy approaches that can be used for groups, including Rational Emotive Behavioral Therapy (REBT) and Cognitive Behavioral Therapy (CBT). The therapist will briefly explain what form is therapy is being used, such as REBT. The therapist will then give the group a new topic to work on or continue a topic from the last session. For example, guilt may be the group’s topic of discussion on any given session day. The therapist may then write the responses on a whiteboard, so everyone can see. Once this group response exercise is complete, the therapist will look over the list and draw some conclusions. For instance, the therapist may point out to the group that all the responses relate to past events and situations. At this point, the therapist may begin to teach the class a tenet of the specific therapy approach that is being used. In the case of an REBT session, the therapist might explain that it was founded by therapist Albert Ellis (who also is a cofounder of CBT). Ellis did not believe that events cause trauma, but rather self-talk around the event causes the trauma. It’s not what happened but how one thinks about what happened. Now that a basic principle of the therapy approach is laid out for the group, the therapist will openly practice this skill on the group. To do so, the therapist will usually call on one person in the group. From week to week, the therapist will be calling on different group members. In general, group therapy posits that the individual can be effectively helped by the group dynamic. Building on the REBT example, on the topic of guilt, the therapist might ask the selected person to discuss some of the self-talk related to the experience. The group member will now have the full attention of the therapist and group. The member may say something like, “I feel guilty for leaving my family. Everything is a mess now; they’ll never trust me again.” The member may believe this statement to be true, but it is the therapist’s duty to help the person understand that it isn’t true. The therapist will try and train this member, and thereby instruct others, on how to overcome negative self-talk. The therapist may point out that she does not believe the statement is true. The therapist may then bring the group in for support and ask if they think it is true. The group will then likely tell the member that they believe everything can be worked out with their family and the family will trust them again. The therapist may then check in with the selected member and see how they are responding to this challenge in their self-talk. If time permits, the therapist will select another member or ask one to volunteer, and the group will run through the same exercise or a new one. The therapist will typically close the session with a summary that reflects lessons learned today, how it connects with lessons from past sessions, and how to integrate these lessons into life between the end of today’s session and the next one (homework). After a review of the session example, one might query why there was no direct reference to addiction. Addiction is a symptom; there is always an underlying thought or belief that compels the addictive behavior, and that’s where therapy focuses. The addiction is relevant, of course, but the details of the drug abuse (e.g., the type of drug abused, how abused, and with whom) are not as instrumental to the recovery process as the belief system underneath them. It is important for a therapist to help clients out of their addiction story to avoid them being stuck in it. For instance, if a person keeps repeating a memory, the negative self-talk around that memory will persist. As in the REBT group therapy meeting example, directly challenging the negative self-talk is key. An overarching goal of group therapy and individual therapy is to help the recovering person shift out of the mindset of addiction and its accompanying negative self-talk. 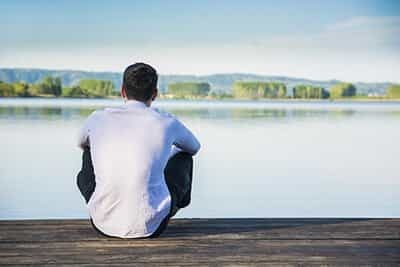 Each story of addiction and recovery is different, but there are some common features of the experience, such as feeling the need to hide the addiction. Keeping an addiction secret, at least initially, is a way to try and protect and perpetuate it. The secrecy leads to a block in communication, which in turn causes a breakdown in trust. Group therapy provides each member with an opportunity to voluntarily discuss their thoughts and experiences in a safe space. This process of bringing thoughts and feelings to light is in opposition to the secrecy that goes on around drug abuse. The group itself aids the recovery process. The American Psychological Association points out several of the additional benefits of group therapy. It helps to improve a person’s confidence and interpersonal skills. It lays the groundwork for attending other group meetings, such as group recovery meetings like Narcotics Anonymous. It provides each member with a supportive social network and thereby shows them what to look for in new groups, outside of the therapy context. Consistently meeting with the same group helps to build trust, develop conflict resolution skills, and promotes accountability. It helps to put personal problems into a more universal framework. A painful thought, emotion, or experience can trigger feelings of isolation; however, it is difficult to maintain a feeling of isolation when other people are sharing similar stories and experiences. It provides a diverse perspective. People in group therapy come different walks of life, and they each have a unique take on a situation, which makes for well-rounded advice. Like all therapies, group therapy provides a recovering person with an opportunity to get expert help that can be instrumental to long-term abstinence maintenance. The key for each group member is to integrate the training and lessons learned in sessions into everyday life. Therapy helps people to bring greater awareness to their thinking. With practice, over time, individuals can train their minds to overcome the negative thoughts, emotions, and behaviors that once kept them in a cycle of addiction.